Venezuela was facing the threat of fresh international sanctions and intensified domestic unrest Monday following President Nicolas Maduro’s re-election in a vote rejected by the opposition as a farce. In a further sign of the escalating pressure on Maduro, the 14 countries of the Lima Group, including Argentina, Brazil and Canada, said Monday they were recalling their ambassadors from Venezuela to protest what they said was an illegitimate presidential election. 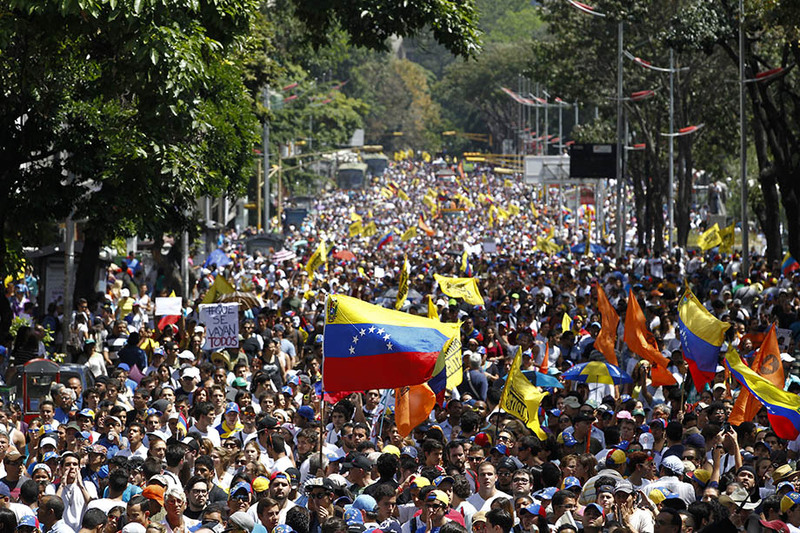 Venezuela was already isolated and deep in the worst economic crisis of its history, with its people enduring food and medicine shortages, that have sparked violent unrest and a mass exodus by hundreds of thousands of people. Election officials said Maduro won 68 percent of the votes cast in Sunday’s presidential poll, far ahead of the 21 percent won by his nearest rival, ex-army officer Henri Falcon. “We won again! We triumphed again! We are the force of history turned into a permanent popular victory!” Maduro told those gathered to celebrate his “knockout” victory. Even before it took place, the United States, Canada, the European Union and a dozen Latin American countries said they would not recognize the results. Falcon, a loyalist of the late leftist firebrand Hugo Chavez who was neck-and-neck with Maduro in pre-election surveys, said the vote lacked “legitimacy” and accused the government of vote buying. And third-placed Javier Bertucci, an evangelist pastor who polled around 11 percent, also joined the call for new elections. Maduro may have won, but the near future appears bleak as the country faces economic ruin. The IMF estimates that Venezuela’s GDP will continue to shrink this year, with the inflation rate expected to reach 13,800 percent. Venezuela has always relied on its oil, but production has dropped to its lowest level in 30 years despite a recent rise in prices. “The upcoming scenario is clear: political tension and radicalization, repression, massive international rejection, a sharpening of sanctions, and a climax to the economic crisis,” said analyst Luis Vicente Leon. Maduro, a former bus driver, union leader, foreign minister and Chavez’s hand-picked political heir, has presided over an implosion of the once-wealthy oil producer’s economy since taking office in 2013. The socialist leader says Venezuela is the victim of an “economic war” waged by the conservative opposition and external powers including the United States aimed at toppling him. Critics, however, blame him for gross economic mismanagement. In his victory speech, Maduro acknowledged that “changes” were necessary. “I will dedicate myself entirely towards economic recovery,” he said, but gave few details. The U.S. market is crucial, as one third of Venezuelan oil exports go to the United States. But Washington has threatened to stop buying Venezuelan oil. U.S. officials have already slapped sanctions on Maduro and his senior aides, and banned US entities from buying any more debt from Caracas or state oil company PDVSA. Venezuela’s crippled oil industry lacks investment and its assets are increasingly prey to debt settlements as the country defaults. Maduro is placing his trust in allies China and Russia. And since his many countries view his reelection as illegitimate, “he will have no capacity for maneuvering in the area of international finances or diplomacy,” warned analyst Andres Canizalez. In Beijing, the foreign ministry said Venezuela’s people and their government “have the ability to deal with their own internal affairs, while the parties concerned should also respect the choices made by the people of Venezuela. “If there is any dispute, the dispute should be settled within the current legal framework of Venezuela,” it said. At his victory rally, Maduro called for a “national dialogue,” even though the MUD opposition coalition said it would step up pressure for “legitimate elections” later in the year. But the opposition is deeply divided, with Falcon stirring up a hornet’s nest when he left the coalition to run for president, and has yet to shake off the stigma of being labeled a traitor. Analysts said the opposition’s greatest challenge is to coalesce around a strategy that will create pressure for change after nearly two decades of socialist “Chavista” rule. As for Maduro, his biggest risk is an “implosion” if government officials are cornered and pressed by the international sanctions, Leon said.